A handful of architecture firms are making their pitches to work on a new home for the Minnesota Vikings in downtown Minneapolis. All say they've all got the experience to design a 21st century stadium to replace the Metrodome, but at an open house last night, they provided few specifics about their ideas. The guiding limitations for the designs: The new stadium has to seat about 65,000 people. The state and the Vikings have about $980 million to spend on the project, and it's supposed to open in late 2016. "We're seeing ideas and concepts. I'm not sure if they're not $2-billion dollar buildings -- and we have to build an $800 million dollar one," said Ted Mondale, executive director of the Minnesota Sports Facilities Authority, which hosted the open house at the Metrodome to introduce the architecture firms vying for the contract. "We do not want the pretty pictures to sucker us in," he said. "We want to look at their qualifications. We want to feel comfortable that we can work with them. We want to know they're flexible. We want to know that they understand our town and that what's important to us and they can work here." 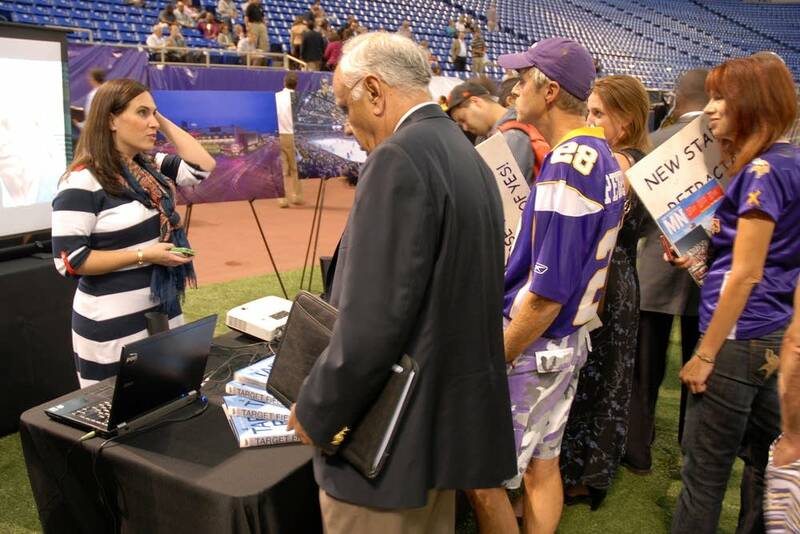 Representatives of the five firms took turns making just that pitch to the Metrodome crowd, comprised mainly of potential subcontractors, a smattering of fans and a few members of the local news media. John Niemuth said his company, AECOM, counts Minnesota as one of its homes. It began in 1909 as Ellerbe and Associates, and designed Target's corporate headquarters and downtown retail store. Its parent firm, AECOM, helped design CenturyLink Field in Seattle. Scott Radecik spoke for Kansas City-based Populous, which designed the Xcel Energy Center in St. Paul, TCF Bank stadium and Target Field. "We're very invested in Minneapolis, and we have been for decades," he said. Dallas-based HKS talked about the new homes it has designed for the Dallas Cowboys and the Indianapolis Colts. Philadelphia-based Ewing Cole showed off renderings of the NFL's most recent venue, the Met Life Stadium. Most of the firms conceded that any of them probably could design a new home for the Vikings -- a task expected to earn architects and engineers $35 to $50 million in the next four years. But what the architects were trying to sell last night was the future -- a home for sports and entertainment in Minnesota for decades to come. Kansas City-based HNTB designed what will be the newest football stadium in the US, for the San Francisco 49ers, under construction now. Tim Cahill, HNTB's national director of design, says fans still want to be close to the action, but the focus for stadium design has shifted away from the game. Cahill says fans want to see outside of the stadium, walk on wider concourses, eat more food, and stay in touch with the newest technology. "You look for ways that people, even when they're just walking around, can still see the game and enjoy the atmosphere. That's the challenge that people have now, is coming up with what can happen at the stadium that you still can't do at home," he said. Stadium officials acknowledged the check list is long, and even added more, including accomodations for concerts, amateur sports and hundreds of other events. But sports authority chairwoman Michele Kelm-Helgen said the designs still have to have two primary features. "Its going to be really important, whatever we build, obviously the architect is going to help us design a facility that can come in on schedule and under budget. I can't tell you enough how important that is," she said. Interviews with the Vikings and the stadium authority will continue today. Stadium officials initially said they could name a designer as soon as next week, but now say they're not sure yet when to expect a final pick.